Inspiring Art Teachers to Explore Art History | Curator’s Corner: What Do You Know? I’m not usually a big fan of realism, but when I come across an artist with an interesting background, I like to share it with you. Goodness knows one does not hear much about sports figures transitioning into being artists (except for Rosie Grier and his fiber arts). I’m certain that there are many other stories similar to this one (at least I’ve convinced myself of that) about sports figures having a more “artistic” side and taking up art after retirement. But, sports-to-art is not the topic of this week’s entry. The subject is the stunning art of a unique individual who just happened to have used boxing to further his career as a painter. Born in Greenwich Village, Anthony Sisti began pursuing drawing at an early age, although his parents did not encourage him. His parents moved the family to Buffalo when Sisti was ten and he began boxing in 1917 in Buffalo. He won the Bantam Weight championship in New York State the next year and boxed for the next 13 years, winning all but fifteen of 100 bouts. He went to Florence to study painting with the money he won from fighting, achieving an advanced degree. Sisti is supposed to have gone to the Congo with Ernest Hemmingway and undertaken many other adventures. But, it was always his painting that was most important. Late in his boxing career he held a boxing match (1939) in order to garner funds to hold an exhibition of his paintings. During the 1930s he opened an art school in Buffalo and also flew once a week down to Manhattan to teach at the New York School of Applied Design for Women. 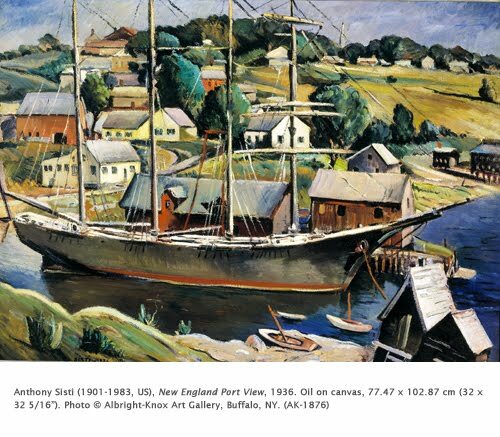 In 1938 he opened Sisti Galleries in Buffalo, which is credited with helping boost the career of major watercolorist Charles Burchfield. As a painter, Sisti’s work is reminiscent of influences from then-current trends in American art, such Regionalism and Precisionism. His compositions often resemble those of Grant Wood and Thomas Hart Benton, while the insistence on softly faceted and boldly shaped forms resembles the work of Charles Demuth and Preston Dickinson. The bright palette, typical of his work, harks back to Impressionism. This charming village scene implies the influence of Wood, Demuth, and the French Impressionists. Among his more important works is a portrait he did of President Franklin Roosevelt. I've discovered Sisti's works when I was a teenager and apparently his creative art appeared to be close to me. I didn't know much about his background thoush, so thx for sharing!